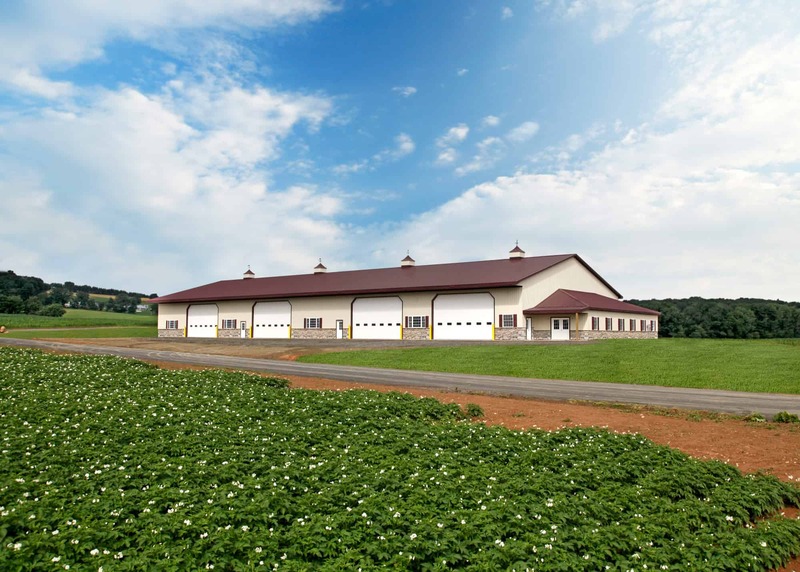 If you are planning to build a small- to mid-sized commercial building, consider the following before deciding whether to build a steel or wood framed commercial building. Steel is an excellent choice for buildings with large clear spans, multiple levels, or heavy loads. However, wooden trusses can span up to 100 feet, and glue laminated posts can be manufactured in just about any length. When comparing steel and wood construction prices for the shell of an 80’ x 150’ x 18’ building, wood will definitely cost less. Some people believe wood framed buildings to have shorter lifespans than steel structures. What they may not realize is that if the proper steps are taken to protect wood from natural elements, wooden structures have the potential to last many decades. Wood may rot, but steel will rust, and both are very detrimental to the structure of a building. Wood is a natural insulator, unlike some inorganic materials, such as concrete and steel. These materials have very low insulation values. As a result, a lot of forethought needs to be used when building with these materials. Most pre-engineered metal buildings utilize blanket insulation. However, when the exterior panels are fastened to the framing members, the insulation gets flattened, making it easier for heat to escape. There are methods of alleviating this and similar problems, but it is much easier to achieve high R values, or better insulation, with wooden framing. If your business or organization is passionate about preserving the environment, a wood framed commercial building will help spread that message throughout your community. Wood (including timber) is a renewable material. Much of the wood used in modern construction comes from managed timberland, set acreage where trees are constantly replanted and carefully maintained for this purpose. Trees naturally absorb carbon dioxide. The timber harvested to construct 2,400 square foot wooden building can retain the same amount of carbon that the average motor vehicle produces in five years. Although steel framed and wood framed commercial buildings can look similar, adding some exposed beams can make a world of difference. In addition to erecting a wood frame, the team at Quarry View Construction can create an exposed timber entrance as well as add exposed wooden beams inside the structure, ensuring your new commercial building is customized to fit your needs and style. Raw wood takes us back to nature’s roots, to simpler times, inviting positive emotions and health benefits ranging from lowered blood pressure to reduced anxiety. Should you decide that you need to add an overhead door to a pre-engineered metal building, you will need to work around the columns. Modifying the placement of steel beams and headers is an extensive and extremely expensive process. Wooden posts and headers are much easier to move and modify, as they don’t require grinding, welding, etc. Wood is a much easier material to modify when compared to steel, making the remodeling process more budget friendly and time efficient. Many projects done by the team at Quarry View Construction combine the strength of steel with the cost efficiency of wood. Adding a few strategically placed steel beams and columns to an otherwise wooden structure can be a great solution. The professional contractors at Quarry View Construction can help you determine whether wood is the right material for your commercial building’s frame. Together, we can build the right framework for your business. Contact us today.